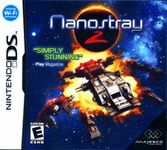 Nanostray 2 is a scrolling shooter video game for the Nintendo DS and sequel to the original Nanostray. It was released in North America on March 11, 2008. Taking place in the future, the supply ship E.S.S. Ariga is returning from its latest voyage when the awakening crew is alerted by a three-year old distress call. The colonized area the Ariga is returning to has been contaminated by a techno-virus known as Nanostray. According to the distress call, the Nanostray virus had infected the colonist technology from computers to war-machines and made each one hostile. A flight commander has been assigned to win back the infested areas and, with the help of Officer Diane Stewart aboard the Ariga, discover and destroy the source of the Nanostray virus. Source: Wikipedia, "Nanostray 2", available under the CC-BY-SA License.